Bedford Playhouse is excited to announce a weekend of screenings and a Q&A event with award-winning writer, TED Talks Speaker and Professor at Columbia University, Dr. Andrew Solomon, September 7-9th. Solomon’s NY Times bestselling book Far From the Tree chronicles the lives of children who were not what their parents expected…or wanted. 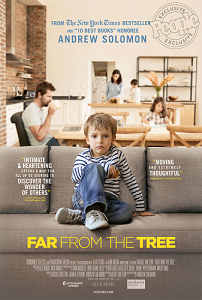 FFTT’s film adaptation examines the experiences of families in which parents and children are profoundly different from one another in a variety of ways – a dives deep into the extraordinary struggles, challenges, humanity and amazing love that exists within these parent-child relationships. Both 7pm screenings will include a Q&A with Dr. Solomon. Special guests include resilient and outspoken cast member Emily Perl Kingsley, and her son Jason Kingsley who has Down Syndrome. Emily has dedicated her life to “proving the doctors wrong” and advocating for Jason to live a “normal” life, which has included roles on Sesame Street and appearances on The Today Show. See our website for more details and showtimes.